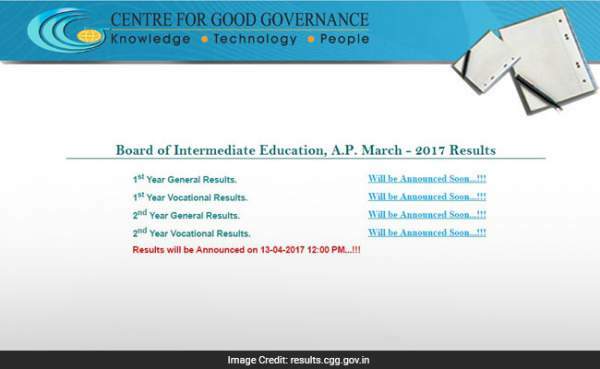 AP Inter Result 2017 BIEAP 1st 2nd Year Intermediate Results results.cgg.gov.in manabadi: Andhra Pradesh (AP) Intermediate results for March 2017 exams are going to be declared today as the official update suggests. The BIEAP first year result will also include the following: 1st year general result, 1st year vocational result, 2nd-year general result, and 2nd year vocational result. The students who appeared in the exam had been waiting for so long. Today, their wait will be over and they will be able to check what they were waiting for so eagerly. After that, they would plan their future plans and higher education accordingly. The 1st year inter exams held from March 1 to March 17, 2017. While, the exams for the second year took place from March 2-18, 2017. AP intermediate March 2017 result will be announced online only. Therefore, candidates should know how they can check their results online. If any students face any kind of problem, they can directly contact the official board members. However, we would recommend waiting a while to check the answers and answer keys as the website will face a huge load at that time. First of all, open the official sites mentioned above for AP Inter Result 2017. On the homepage, look for the link stating AP Inter 1st Year Results 2017 or AP Inter 2nd Year Results 2017. Click on the relevant one. Now, it will ask you to enter the roll number, name, school name, etc. Enter the asked details and click on the submit button. The result will appear on the next page. Save (download) and take a print-out of the same for your future reference. Candidates of groups like MPC, MiPC, MEC, CEC, HEC, and others can also check the results today. TheReporterTimes.com wishes you all the best for your result and future. If you don’t mind, feel free to share your results and queries with us via commenting below.